The Sony 20mm f/2.8 E Mount Lens is a super compact pancake-style lens for Sony's crop frame (APS-C sensor) cameras such as the a6500. It is also compatible with the a7 series of Sony cameras but only when shooting in crop sensor mode. It features a Direct Manual Focus mechanism that allows for precise manual focusing at anytime, which is particularly useful for critical focus when shooting video. The smooth and quiet internal STM motor provides continuous AF focus as well as aperture actuation, making this lens ideal for shooting video during events. Less than an inch long and built with aluminum alloy, it is both compact and durable. 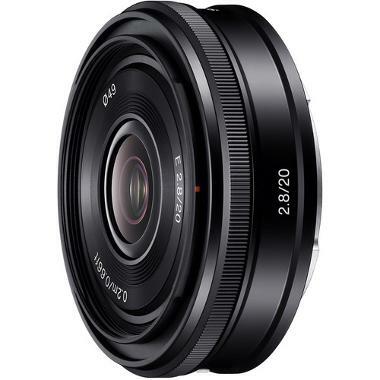 • This lens is compatible with Sony E mount cameras in crop sensor only. The focal length equivalent for 35mm format is 30mm. • This lens is not compatible with Sony a7 series cameras unless in crop sensor mode. • This lens has an STM AF motor which supports cameras with Movie/AI Servo AF.